The work of German cultural theorist and art historian Aby Warburg (1866–1929) has had a lasting effect on how we think about images. This book is the first in English to focus on his last project, the encyclopedic Atlas of Images: Mnemosyne. Begun in earnest in 1927, and left unfinished at the time of Warburg's death in 1929, the Atlas consisted of sixty-three large wooden panels covered with black cloth. On these panels Warburg carefully, intuitively arranged some thousand black-and-white photographs of classical and Renaissance art objects, as well as of astrological and astronomical images ranging from ancient Babylon to Weimar Germany. Here and there, he also included maps, manuscript pages, and contemporary images taken from newspapers. Trying through these constellations of images to make visible the many polarities that fueled antiquity's afterlife, Warburg envisioned the Atlas as a vital form of metaphoric thought. While the nondiscursive, frequently digressive character of the Atlas complicates any linear narrative of its themes and contents, Christopher D. Johnson traces several thematic sequences in the panels. 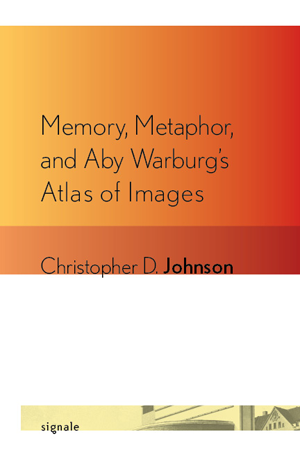 By drawing on Warburg’s published and unpublished writings and by attending to Warburg’s cardinal idea that "pathos formulas" structure the West’s cultural memory, Johnson maps numerous tensions between word and image in the Atlas. In addition to examining the work itself, he considers the literary, philosophical, and intellectual-historical implications of the Atlas. As Johnson demonstrates, the Atlas is not simply the culmination of Warburg’s lifelong study of Renaissance culture but the ultimate expression of his now literal, now metaphoric search for syncretic solutions to the urgent problems posed by the history of art and culture. Christopher D. Johnson is Associate Professor of Comparative Literature at Harvard University. He is the author of Hyperboles: The Rhetoric of Excess in Baroque Literature and Thought.